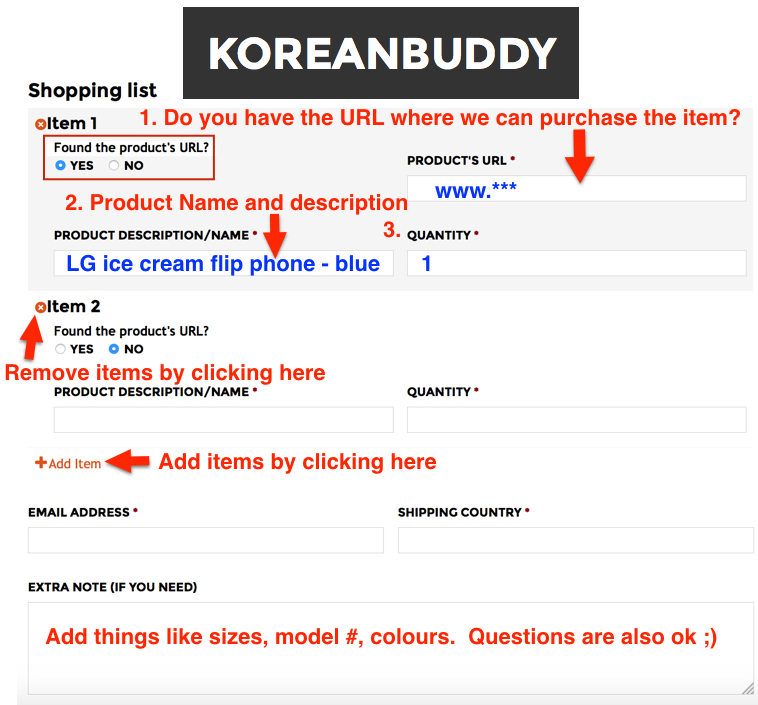 In this guide I am going to show you exactly how to find specific items, pick options and sizes and the get the required information to order off of EvaJunie using KoreanBuddy. EvaJunie sells more sophisticated fashions for women professional women. The prices are quite good, although slightly higher than some of the other sites selling young fashions. You can see women in their 20’s, 30’s and 40’s wearing these fashions in Korea. Tip #1 – EvaJunie English, Chinese, Japanese websites; however, the prices are MUCH cheaper on the Korean site. Congratulations, you just saved 15%-25%!!! Tip #2 – The search function only works using Korea. 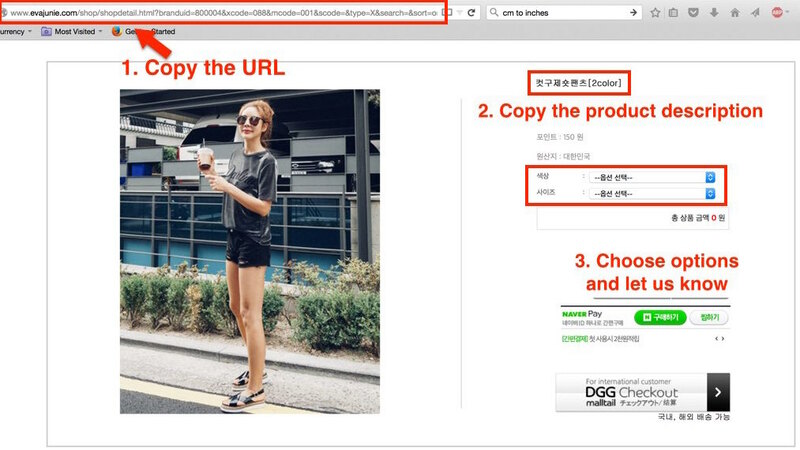 If you want to use the search, go to the fashion glossary and copy and paste the Korean word of the the items you want to search. I’m going to search the Korean site because I want to save 15-25%. On the main menu from the left, new items have a 5% discount, best are the top selling items, Only Eva lists sale items. These items are usually from the past season, like summer items for sale in the fall etc. Then Betterglam is a separate brand of athletic and casual wear. 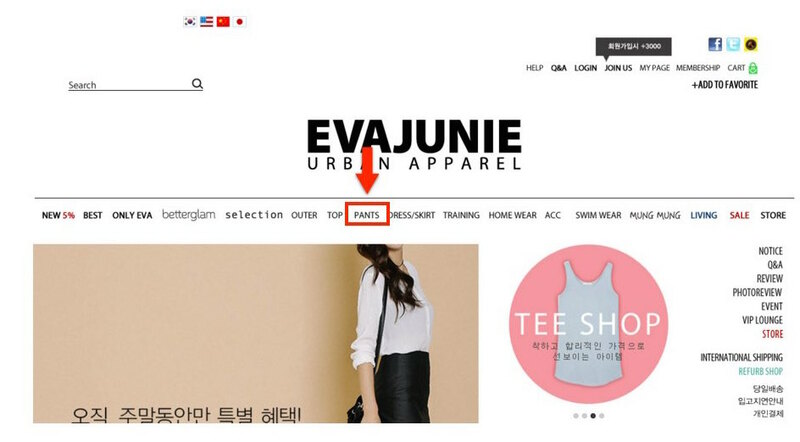 Product #1: Ripped jean shorts – like many Korean sites, shorts and pants are grouped together, so click pants from the main menu. On the English site, you will see the subcategories right away, just click on shorts. On the Korean site you have to scroll down two rows to see the subcategories, and they are all in English! For help with sizing, check out the clothing size charts. I found these shorts halfway down the first page. 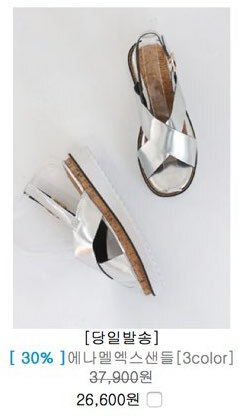 On the Korean site they are 15,900 won or $13.44 USD, and on the English site they are $18.83. That’s a huge difference! On the Japanese site they are $19.13!! To order these shorts 1. copy the URL and paste it into the order forms on KoreanBuddy 2. copy and paste the product name. 3. Tell us the options you want, color and size etc. When it comes to the options, there is good and bad news, the good news is the waist size is written next to the size selection which makes choosing sizes easier. The bad news is, they colors are not shown in English. The way to see color options is to scroll down towards the bottom of the page to see the different color options. Near the bottom you can also see the other items the model is wearing for sale. Here they are just selling the shoes she has on. At the very very bottom they have customer reviews. Only in Korean though. Product #2: Black A-line skirt – from the main menu click on dress/skirt and then click skirts on the subcategory menu. The fashions on EvaJunie are more sophisticated than the basic fashions on other sites, and I found this great dress for just under the 30,000 won limit. It’s 29,900 won on the Korean site and $35.41 or 41,900 won on the English site! Big savings, thanks KoreanBuddy. 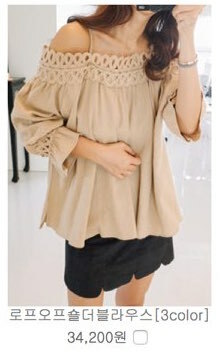 To order this skirt 1. copy the URL and paste it into the order forms on KoreanBuddy 2. copy and paste the product name. 3. Tell us the options you want, color and size etc. To see the color options you will have to scroll down about 80% of the way to see the three colors this skirt comes in. Just below that you can see the other items the model is wearing in the photos for sale. Here they are also selling the shirt.